Mary McDermott, MD, ’92 GME, Jeremiah Stamler Professor, has been named a Distinguished Scientist by the American Heart Association for her research into peripheral artery disease (PAD). Mary McDermott, MD, ’92 GME, the Jeremiah Stamler Professor of Medicine in the Division of General Internal Medicine and Geriatrics and of Preventive Medicine, has been named a Distinguished Scientist by the American Heart Association (AHA). The award honors prominent scientists and clinicians who have made significant contributions to the understanding of cardiovascular disease and stroke. “This is a tremendous honor, in part because I have such great respect for the American Heart Association and in part because there are so many other scientists who are also conducting extremely notable and innovative work. I’m grateful and honored that my work was recognized,” said McDermott, who was presented with the award during the annual AHA Scientific Sessions this month. McDermott, who joined Feinberg’s faculty in 1994, has dedicated her research to lower extremity peripheral artery disease (PAD), a condition in which atherosclerotic blockages in the legs cause pain or weaknesses when walking. Traditionally, peripheral artery disease was considered relatively benign, as most people with PAD report that their leg symptoms do not worsen over time. But McDermott’s research team demonstrated that people with the disease limit physical activity in order to avoid leg pain and, as such, experience declines in walking ability at a much faster rate than those without PAD. Among her many research accomplishments in this area, McDermott also demonstrated that supervised treadmill exercise improves walking ability among people with PAD, even when they are asymptomatic or have atypical leg symptoms. In collaboration with Bonnie Spring, PhD, director of the Center for Behavior and Health in the Institute for Public Health and Medicine (IPHAM), McDermott further established that when behavioral techniques are used, home exercise can also significantly improve walking ability and prevent mobility loss in people with PAD. More recently, working with Robert Sufit, MD, professor of Neurology and Surgery, McDermott demonstrated that PAD is associated with significant calf skeletal muscle damage that appears to independently contribute to walking impairment. This month, a new clinical trial led by McDermott showed that a stem cell therapy did not improve walking ability in people with PAD, although exercise did lead to significant improvements. The results were published in the Journal of the American Medical Association. Currently, her team is conducting clinical trials, funded by the National Institutes of Health (NIH) and the Patient Centered Outcome Research Institute (PCORI), to test novel interventions — including with telmisartan, metformin and a hepatocyte growth factor — to improve walking performance with PAD, as well as novel home-based exercise programs. McDermott is also investigating calf skeletal muscle damage in PAD, which could provide a target for novel therapies. McDermott earned her medical degree from Michigan State University College of Human Medicine and completed her residency in internal medicine at McGaw Medical Center of Northwestern University. 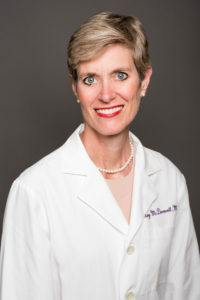 Over the course of her career, McDermott has received a number of other notable awards and honors, including induction into the American Society for Clinical Investigation, election to the Association of American Physicians and designation as Master of the Society of Vascular Medicine. She has previously also received the Society of General Internal Medicine’s Junior Investigator of the Year Award, the AHA’s Established Investigator Award, and the National PAD Coalition’s Research of the Year Award.